Last year Jalopnik had a beautiful 2013 Cadillac CTS-V manual-shift wagon in our daily Nice Price Or Crack Pipe feature. One of you lunatic readers liked it so much that the car ended up being shipped across Canada, where it made an appropriately massive impression. The Cadillac CTS-V Wagon represents a rare confluence of impressive performance, utility and inherent uniqueness. That’s why we lose our minds over the thing, and why the look on this woman’s face is so relatable. 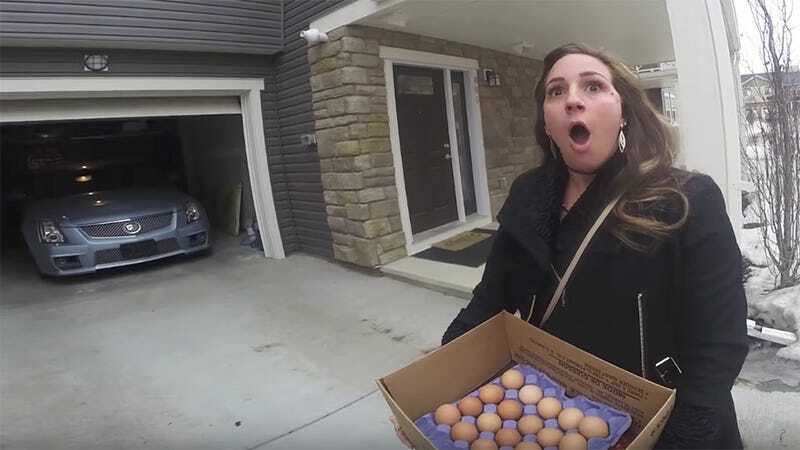 Bold move surprising her while her hands were full of eggs, but it looks like no food products were harmed in the reveal of this lovely looking silver-blue CTS-V.
First of all, you’re welcome Markus. And thank you for reading, enjoying your car and using it to bring joy to the world. Thanks also to everyone reading this. You’re all contributing to perpetuating car culture and we appreciate it. Now get off your computers and go driving! I mean, after work I guess.